In a competition that pits wheatgrass juice against wheatgrass powder, there are multiple schools of thought about which is more effective. Ann Wigmore, the late founder of the Natural Health Institute in Puerto Rico, strongly supported consuming wheatgrass immediately after juicing the young blades. Other alternative medicine practitioners feel the powdered variety is stronger because it is more concentrated. In the end, many supporters of wheatgrass as a healing agent don't care which modality is consumed as long as you incorporate some form of wheatgrass into your daily lifestyle. Dr. Charles Schnabel, an agricultural chemist, started growing wheatgrass in northeast Kansas in 1925. He fed dehydrated wheatgrass to chickens and cattle with successful results suggesting improvement in their health and productivity. Ann Wigmore successfully continued the research, using herself and eventually the sick people around her as subjects. Schnabel began growing wheatgrass to use for his experiments in northeast Kansas, but nowadays, wheatgrass can be grown almost anywhere as long as you follow proper procedures. During winter months, a temperature of 65 to 75 degrees is an optimal temperature for a successful home for your plants to thrive in. 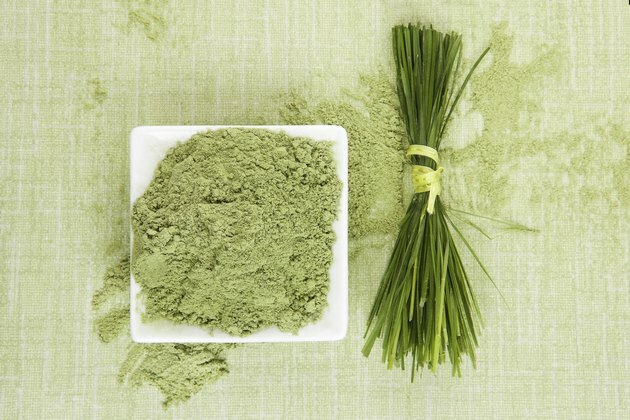 There have been small studies conducted to determine the efficacy of wheatgrass. According to NYU's Langone Medical Center, one study included a group of people with ulcerative colitis, a chronic and often painful intestinal disorder. Some were given a placebo while others were given wheatgrass. Those who were given wheatgrass reported improvements in their symptoms, but the study was still dismissed. The reason: the bitter taste of the wheatgrass was easy to detect, therefore, participants knew whether they had the wheatgrass or the placebo. According to the American Cancer Society's website, other studies -- even some studies where tumor shrinkage was reported -- claimed not to be dependable for similar reasons. Wheatgrass contains sodium, iron, calcium, magnesium, potassium, selenium and zinc as well as chlorophyll and vitamins A, B-complex, C, E, and K. These are all nutrients traditionally and scientifically credited as being necessary for optimal health. Chlorophyll makes the blood more oxygen-rich. When the blood has more oxygen, it pumps better and carries more nutrients to all of the cells in your body. When the cells have more nutrients, they perform better and you experience higher energy levels and benefits such as reduced blood sugar, reduced high blood pressure and improvement of your body's ability to heal wounds. In the end, it comes down to a matter of opinion, lifestyle and preference. Consider the benefits of each. The powder is easy to scoop into your favorite drink, it lasts longer than the fresh juice and if you travel, you can easily take the powder with you to maintain your regimen. It also contains fiber. Fresh wheatgrass juice contains live enzymes to fend off microbes and viruses. If you use freshly juiced wheatgrass, you know exactly where it comes from. You are either growing and juicing this yourself, or you're watching someone press the young plants into juice with your own eyes.